Some sources say that Jackie Mitchell was born in 1912 or 1913. Other sources say that she was born in 1914. Regardless of the year, she was a survivor from the start. When Virne Beatrice "Jackie" Mitchell was born, she only weighed three-and-a-half pounds. But as soon as she could walk, she went with her father to the baseball diamond. From him, she learned the basics of the game. At that time, Jackie was living in Memphis, Tennessee. Her next-door neighbor was a minor league ballplayer by the name of Dazzy Vance. Dazzy (who would later play for the Brooklyn Dodgers) quickly recognized Jackie's talent. In fact, he taught her how to throw his favorite pitch. He called it the "drop pitch." This pitch would come in at one level . . . but dropped, right before it reached the plate. 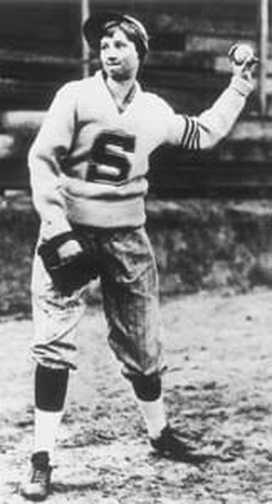 Even though Jackie was only five or six years old, she learned how to throw this pitch. Dazzy Vance was impressed. With foresight, he predicted that Jackie would become a great ball player. With confidence, Jackie believed him. When Jackie was sixteen years old, she played for a women's team in Chattanooga, Tennessee. When she was seventeen, she attended a special baseball school in Atlanta, Georgia. As a result, Jackie attracted the attention of Joe Engel, the president and owner of the Chattanooga Lookouts. He offered her a contract to play for the entire 1931 season. On March 28, 1931, Jackie signed the contract. At that moment, she became an official member of the Chattanooga Lookouts, a Class AA minor league team. Meanwhile, the New York Yankees had finished spring training in Florida and were on their way to New York. As in previous years, they would stop in Chattanooga to play the Lookouts. The game was scheduled for April 1. Unfortunately, it rained, and the game was cancelled. By Thursday, April 2, the rains had stopped. At 2:30 that afternoon, the game began. But Jackie was not the starting pitcher. Instead, she watched. Earle Combs, the Yankees' lead-off batter, clobbered a double. Lyn Lary was up next. He slapped a single up the middle, scoring Combs from second. Next to bat was Babe Ruth. At that moment, Manager Niehoff headed to the mound. He pulled the starting pitcher and waved Jackie to the mound. Jackie's first pitch to the Babe sailed high for a ball. But her next three pitches were strikes. In fact, her final pitch dropped across the plate for a called third strike. The crowd of 4,000 went wild. But Jackie's work was not over. The next batter was Lou Gehrig, the Yankees' clean-up hitter. On three pitches, she struck him out, too. The news about Jackie's strikeouts spread across the country. Fan mail poured in. One envelope had no address -- just the words "The Girl Who Struck Out Babe Ruth." Although Jackie did not continue to play for the Lookouts, she still continued to play ball. In fact, for five years she pitched for the House of David, a baseball team that traveled across the country. At the age of 23, Jackie returned to Chattanooga to work for her father, an eye doctor. She lived the rest of her life in the Chattanooga area. Jackie died in 1987. However, she always will be remembered as "The Girl Who Struck Out Babe Ruth."